This week we are continuing the discussions we’ve been having over the last several weeks regarding the Business Success Advisory Team (BSAT) Program that is also by the Small Business Administration in the Prince George’s county, Maryland, area. Every third Thursday, the small business owners have the opportunity to sit around a table with industry experts and resources to discuss key areas of focus for their business. Today my guest is Loretta Fuller. She is the expert that will be presenting in the upcoming session of the BSAT Program. She is President of Insurance Solutions Associates, located in Prince George’s county. Loretta Fuller graduated from Immaculata Women College in West Chester, PA, with a BA Business Administration. 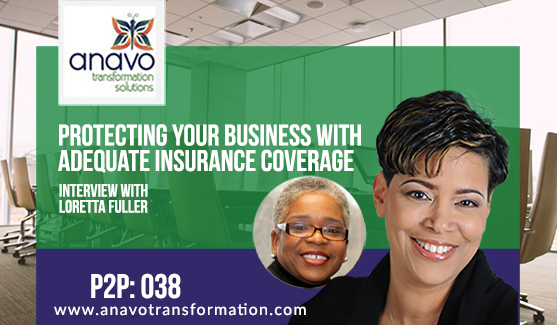 Loretta Fuller has 20+ years in the insurance industry. She has owned her owned independent agency for 17 years; she was formerly a State Farm Agent. Loretta Fuller has earned her insurance designation as Accredited Advisor Insurance (AAI), and Construction Risk Insurance Specialist (CRIS) designation. She continues to demonstrate her passion for informing, insisting and instructing on basic and broad insurance coverage for small to large businesses. Her firm is licensed in Maryland, District of Columbia, Virginia, North Carolina, Pennsylvania, and the state of Louisiana. Insurance Solution Associates proudly opened the Washington DC location in 2013. Loretta Fuller, commits fully to helping small business does not go un-notice by her clients, her colleague, or by the public and private sector. What are you planning to present to the small business community? How often do you see companies who fail to be aware of some of the requirements in contracts with their brokers? What types of insurances should a business owner concern themselves with? At what point in their business should a business owner have insurance? What are common pitfalls you see small businesses fall into when they don’t have insurance? How to find the right broker to work with. Why you should buy business insurance from a someone who specializes in business insurance. The difference between different types of insurances business owners can have, and why you should consider one type of insurance over another. The importance of having cyber liability.